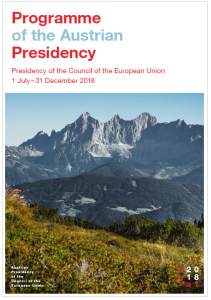 On 1 July 2018, Austria has assumed the Presidency of the Council of the European Union for the third time after 1998 and 2006. As holder of the Council Presidency, Austria will contribute significantly to the legislative and political work of the Council. An important aspect for the work of the Austrian Council Presidency concerns the elections to the European Parliament, that will take place between 23-26 May 2019. As the Parliament’s legislative period is coming to a close, it will be crucial to prepare the finalisation or reach agreements on as many open legislative proposals as possible. Thus, one of the main tasks of the Austrian Council Presidency will be to reach common positions of the Council on individual proposals. These common Council positions are a precondition for negotiations with the European Parliament. These negotiations, also known as “trilogues”, are usually very intensive and present a particular challenge for the Presidency. 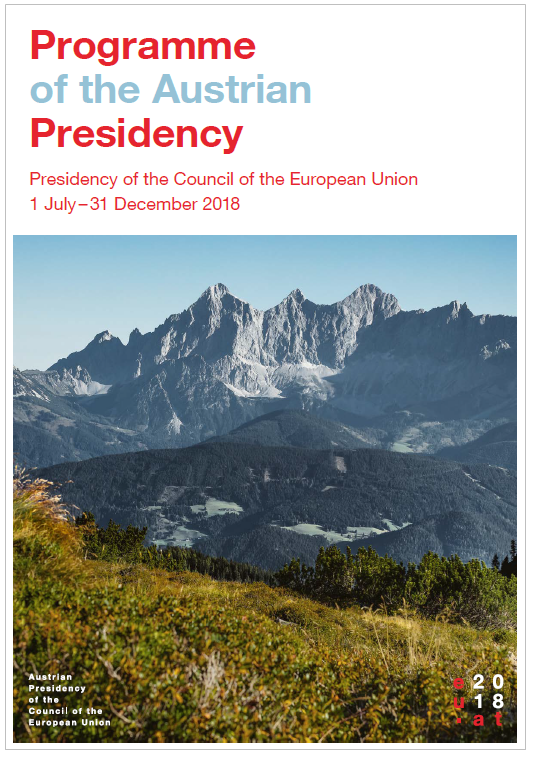 In line with the trio presidency’s programme, the Austrian Presidency will continue the work on the circular economy, with a special focus on eco-innovative initiatives. Key goals include a healthy environment, the efficient use of resources, eco-friendly and sustainable growth, and measures for a non-toxic environment. Active climate protection will constitute a priority in environmental policy during the Austrian Presidency. With respect to agriculture, the priority of the Austrian Presidency is to negotiate the proposals made by the European Commission on the modernisation and simplification of the Common Agricultural Policy (CAP) after 2020. In addition, the Austrian Presidency will devote its attention to improving Europe’s supply with vegetable protein, implementing the Bio-economy Strategy in the agriculture and forestry sectors, and working on the dossiers on veterinary and phytosanitary matters, forestry and fisheries. On 14 June the revised European Organic Farming Regulation (EU) 2018/848, repealing Regulation (EC) No 834/2007, has been published in the Official Journal of the EU. The Regulation entered into force on the third day following of its publication. It shall apply from 1 January 2021. From then the Member States will have 24 months to transpose those directives into their national law. The deadline for transposition will be 4th July 2020. In addition to the revision of the Organic Farming Regulation, the Regulation (EC) No 889/2008 laying down detailed rules for its implementation has been revised as well and can be commented until 23 July 2018. With regard, to compost and digestate no changes in the implementation rules and its Annex I ‘Fertilisers, soil conditioners and nutrients’ were made. The revision is based on the latest recommendations by the Expert Group for Technical Advice on Organic Production (EGTOP) with regard, to include ‘industrial lime from sugar production’ as fertiliser and several specific plant protection products (Allium sativum, COS-OGA, Salix spp. Cortex, sodium hydrogen carbonate). The draft implementation rules can be accessed here. The Compost Council of Canada invites to their 28th National Annual Organics Recycling Conference, which promises to bring together expertise in all aspects of organics recycling – from collection of feedstocks to processing, engineering, communication and compost markets. A diverse set of facility tours, a wide array of speakers, a trade show area featuring technologies and service providers will be offered.